I am a lifelong resident of Summerville and my family has been in the Summerville area since the early 1930s. 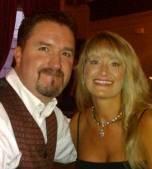 Sherry moved to Summerville in 1991 and in 2002 we married. In 2005, our family grew by one when we had our beautiful daughter Katelyn and in 2011 added our handsome son Brady. My local knowledge and experience are key in helping buyers and sellers achieve their ultimate goals. In November 2004, I became a Real Estate Professional and in 2005 was named Rookie agent of the year for the company at which I worked. In 2006, I was named agent of the year for that same company. Sherry joined me as a Real Estate Professional that same year. We moved to Horne Realty in 2009 to better serve our clients. Let our 26 years of experience work for you.